This week’s project highlight comes from a dumpster rental in Bolingbrook, Illinois courtesy of our client, James Clark. According to James, a buddy of his hired he and his brother to clear out a closed store space and prepare it for new commercial potential! While we aren’t sure whether it will be a new retail store or some sort of service business that will eventually move in, the brothers had to put in a bit of elbow grease to get the place spruced up. Old shelving, materials and debris were removed and light repairs and touch ups were necessary. Once the shelving/displays were hauled out, James said that the area only needed some TLC and a massive deep cleaning. 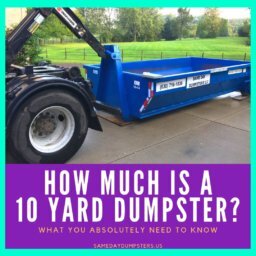 James chose Same Day Dumpsters based on a web search for the best deals on dumpster rentals in Bolingbrook. After reading reviews and speaking with the owner, Martin, he booked a dumpster to be delivered straight away. We are pleased to have been able to assist James on his endeavor and look forward to working with him in the future on whatever new adventure he embarks upon! Thanks for the pic, James, and we wish your friend the best of luck with his revamped space! We LOVE to hear what projects you are using a Same Day Dumpster for so send us a photo! Would you like to submit a photo for your chance to be featured in our “In The Streets” series? Please leave a comment below or use our contact form to reach us and let us know! If you are ready to tackle your next big project and need a dumpster rental in Bolingbrook, find out how we can be of service to you!